Even though I have shared a couple of plant collection videos on my YouTube channel I have yet to share them with you on my blog so I thought now would be the perfect time! I have always liked Cacti and Succulents and have had a few in my life for the last few years but earlier this year my house plant collection really started to take off . I knew I wanted our new house to be filled with more plants so I slowly but surely started to build my collection. In fact every time I visited my favourite garden centre, Perrywood in Essex, I seemed to come home with more indoor plants! The first photo prompt of this month was 'My Collection' so this was a great opportunity to get all my plants together in one spot and take a photo of them all. When I did put them altogether I couldn't quite believe how many I had! When they're spaced out throughout the house you don't really realise how many you have but this exercise made me realise that I have quite a substantial collection and that maybe I need to stop adding to it. I think I counted 35 in total! I know what you're probably thinking, it's not very minimalist to have so many house plants and part of me would agree. I feel like it has become somewhat of an addiction but they certainly help my house to feel less stark and I especially love the contrast between the white walls and the vibrancy of the greens of my plants. I think in many ways it is a very clean looking and minimal aesthetic and I know now that I would much rather have these plants, which bring me a lot of happiness, opposed to a load of nik nacs and junk laying around. Plants somehow don't make my home feel cluttered or stressful like my 'stuff' used to. In fact I find their presence rather calming. Also, along the lines of thinking about minimalism, it's not about depriving yourself of the things that do bring you joy. If I didn't get happiness from my plants I would definitely change things. In fact there is one plant in particular (my dreaded fern) that is stressing me out more than it is bringing me happiness so I am looking to re-home it. House plants also do serve a purpose and have their benefits. I'm in no way a plant expert but plants do have air purifying qualities like this Aloe Vera (above) which I read helps for a more restful nights sleep due to it producing oxygen at night. My Aloe Vera consequently lives in my bedroom. Since owning a more substantial house plant collection I have had to make some adjustments in my life to ensure that I look after them properly. Thankfully nearly all of the ones I own are pretty low maintenance and only require watering once every week - 2 weeks, if not longer. I have therefore tried to get into the routine on a Sunday morning of taking the time to water the ones that need it, reposition them if needed and tidy them up. A couple of my bigger plants like my Monstera do occasionally need their leaves wiping over with water to avoid them getting dusty. I have actually found it quite therapeutic looking after them all and I like the routine I am now in of taking care of them. I am also quite amazed that I seem to be doing a pretty good job at keeping them all alive! House plants for me also make a great object to photograph. So many of mine are extremely photogenic and if I am ever looking to make a photo more interesting I can almost guarantee that adding a house plant does the job. This will be my first Winter with house plants and my only concern at the moment is how they are going to fit in with festive decor. Many of my house plants have a tropical feel to them and they definitely aren't going to work alongside a Christmas tree. Maybe I am wrong though and I guess I'll only find out when it comes to decorating the house but at present I am considering moving them to one or two rooms so that our main living area can feel really Christmassy. I guess going forward I would like to feel more knowledgable about the plants I own. At the moment it feels like a lot of guess work and I am absolutely terrible at remembering their proper names. We named the one above 'Old Gregg' because it reminded Andy of the character from The Mighty Boosh! So yes I would like to know more and to feel like I am winging it less. 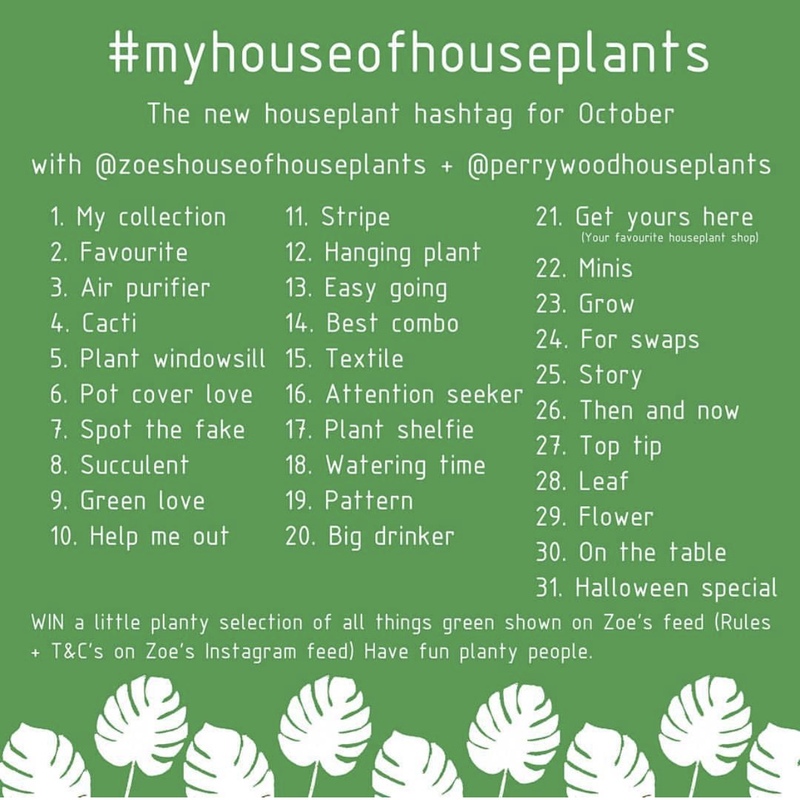 If you'd like to see more of my plant collection then just head over to my Instagram where I am sharing daily snaps at the moment until the end of October. No doubt I will probably end up adding to my collection over the coming months too so Instagram is a great way to stay upon to date with any new additions I may add to the family! (*Although I really, really, shouldn't buy anymore! ).